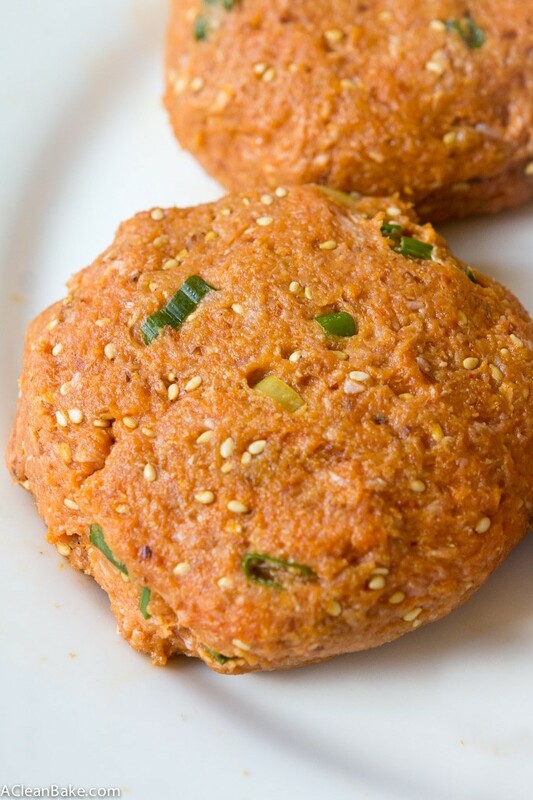 Easy to throw together and completely unexpected, these Korean turkey burgers are a quick, easy and satisfying twist on a healthier burger! When you see a recipe with “turkey” in the title 2 days before Thanksgiving, I suppose it is reasonable to assume that the turkey is garnished, roasted, and carved in some sort of official Thanksgiving-y capacity. Uh…well, this isn’t that turkey. But can we all agree that there’s no such thing as too much turkey the week of Thanksgiving? In a year where the Thanksgiving holiday will be, for me, anything but conventional (hello, due date.) I think it is only fitting to share a totally-in-a-different-hemisphere-from-conventional version of the holiday’s famous entree. I don’t think we’ll be having turkey burgers for Thanksgiving this year, but literally anything could happen (I could end up having ice chips and an epidural for Thanksgiving dinner; who knows), so let’s consider these burgers a really fascinating backup plan. Or, I could just stop torturing you with the idea of burgers on Thanksgiving and we could call these what they are: an unexpectedly delicious way to eat turkey the other 364 days of the year. It all started with a bottle of Gochujang. Two bottles, to be precise. I don’t remember why, but I put two little bottles of this Korean hot pepper sauce in my husband’s stocking last year, probably in an attempt to bribe inspire him to try to cook more. He claims he doesn’t know how to cook, but actually just doesn’t do it very much. When there is Asian food involved, he cooks, and cooks well. But, perhaps this sauce was a little too adventurous for either of us, because both bottles sat, sad and abandoned, in our cupboard, for months. Garlic and ginger because…. Korean flavors? I don’t know. It just seemed (and still seems) like the right thing to do. 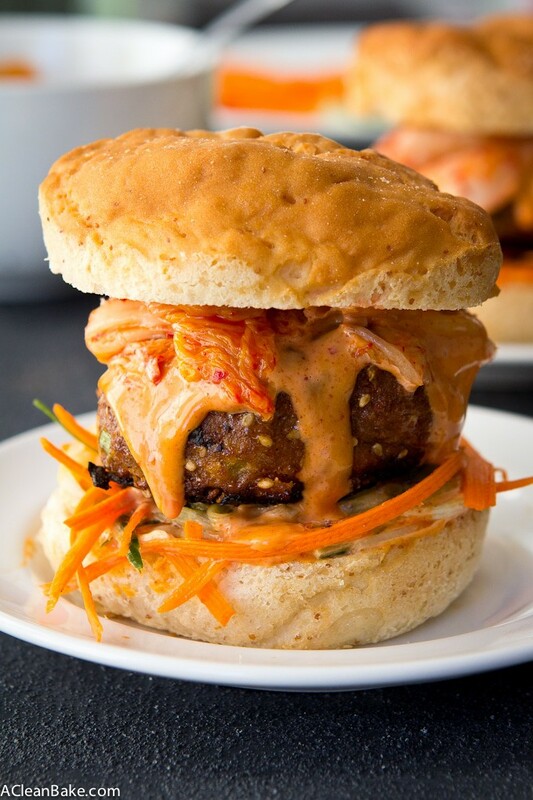 I finished the burgers by serving them on a bed of julienned carrots and cucumber (you can add or sub daikon instead, if you can find it) and topping them with a cooling Gochujang mayo and juicy, spicy (or mild, if you prefer) Kimchi for an extra burst of flavor (and probiotics!). And luckily, they turned out great and we’ve been making them regularly ever since. Sorry, centuries of delicious, complex and perfectly crafted Korean cuisine, for totally bastardizing you. But just wait until you try these burgers! In a large mixing bowl, mix the burger ingredients until well-combined. Use your hands if necessary to make sure everything is thoroughly incorporated. Divide the mixture into 4 portions (about 1/2 cup each) and bake, fry or grill until cooked through. While the burgers are cooking, prepare the toppings. First, whisk together the mayo and gochujang. Set aside. Next, gently toss together the carrots and cucumber and/or diakon. Set aside. 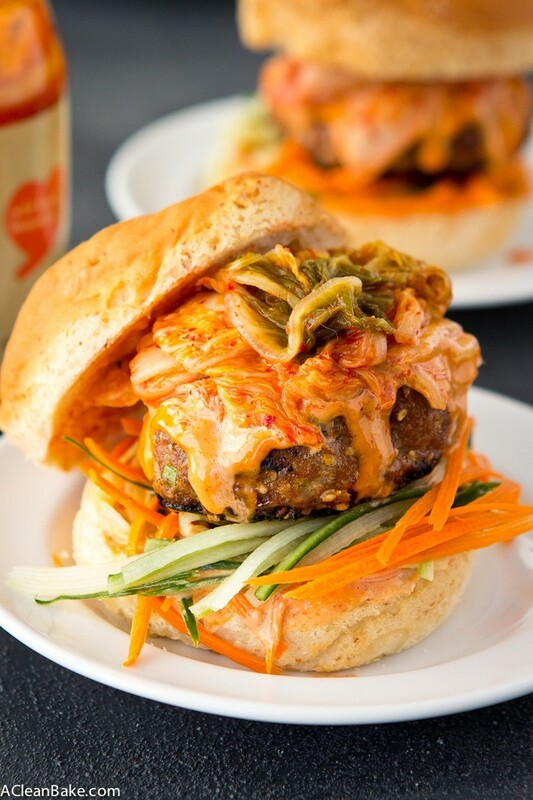 When the burgers are done cooking, assemble by placing a generous pile of the carrot mixture on the bottom half of your bun (or one side of the lettuce wrap) and place a burger on top of that. 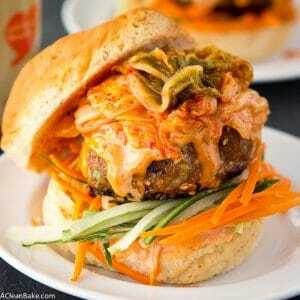 Add a spoonful of the mayo-gochujang sauce, and finish with a scoop of kimchi. Add the top of the bun, or fold over the lettuce and serve immediately. 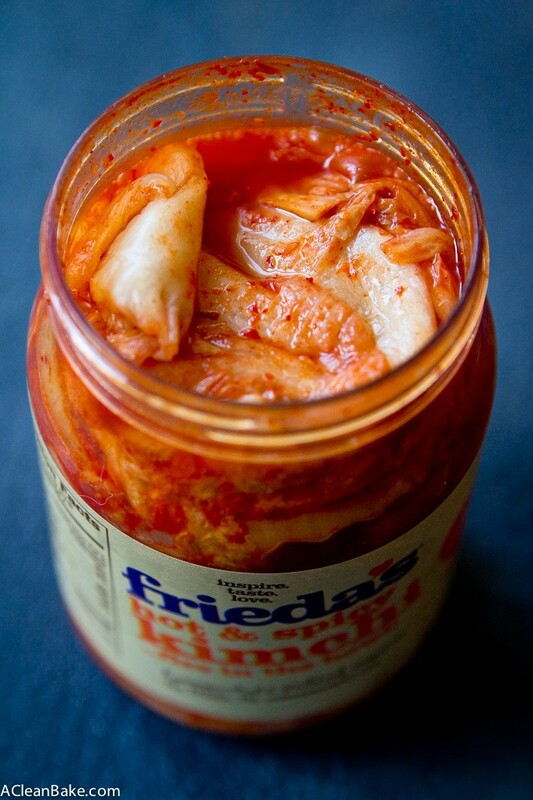 If you are sensitive or allergic to gluten, be careful what gochujang you use, as some varieties contain soy sauce. The brand I used (this one) does not contain soy sauce. It does, however, contain some cane sugar and rice syrup (a form of sugar), so beware if you are especially sensitive to sugar. Note: Bun/lettuce wrap not included in nutritional analysis. Thank you to Now Foods for providing the ingredients that inspired this delicious recipe. 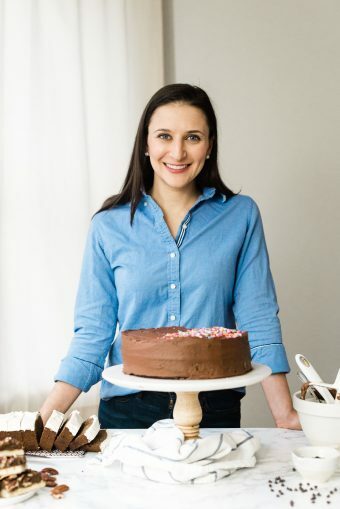 This post contains affiliate links, which means that if you click through and purchase a product, A Clean Bake receives a small commission, which goes toward continuing to bring you delicious, healthy recipes every week. This does not affect the price you pay. Thanks for supporting A Clean Bake! Nora, these look SO good! 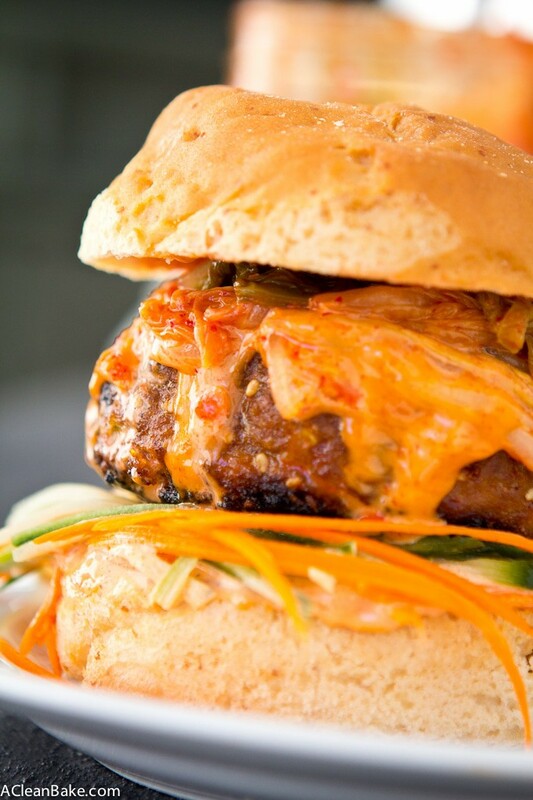 I normally make a thai peanut-y turkey burger, but I will be switching it up next time! Thanks!! I hope you like them! PS: Your Thai burgers sound incredible! these look incredible! my friend ellie RAVED about them & i’m saving these for this summer & grillin’ season! These look so delicious. I love turkey burgers!